Like so many TV series these day, the producers have to make some of the high-tech stuff the heroes or the villains use just a little bit better than what really exists yet so that audience is impressed. This crime drama on ABC is a prime example. Watching it gives the viewer the same sci-fi feel we got in the 1960s when James Bond pulled things out of his pockets that hadn't actually been invented yet. Frankly I was disappointed in this show until the one shown this week on April 24th. It had a better story than the previous ones. What this show does NOT do however is exaggerate the amazing illusions that magicians perform. If you've ever watched shows like Master's of Illusion, you'll know that nothing could be more incredible than the mind boggling illusions they live perform on stage. Like the one that uses a box with glass walls on a raised platform with wheels that allow the magician to turn it around 360° and show the audience that there's no trap door, and then he covers it with a cloth for five seconds before whipping it away again to reveal a lovely lady. Here's a simple example of that trick. This one is better still. A smaller box . . . and more girls! I've watched the first three episodes so far, and found them reasonably entertaining - complete with Vinnie Jones as one of our hero's behind-the-scenes technicians. So far this show has failed to win my heart the way Limitless did, a show I've watched all the way through it's one-and-only season three times! I talked Bulldogtrekker into watching a few episodes with me while we chatted on Facebook, but he said he couldn't follow the plots. He and I shared Deception until he became too ill, which was about two weeks ago. 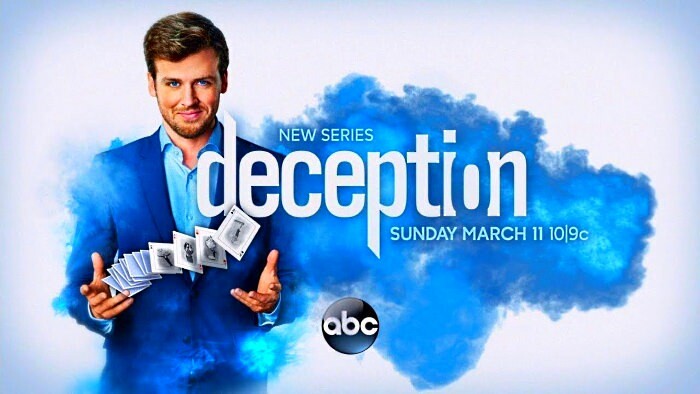 Deception has been cancelled, along with Scorpion, and Designated Survivor. I'm beginning to think that good shows like these are NOT being cancelled because network executives lack intelligence — it's because there aren't enough smart people out there watching the shows that require intelligent viewers! After all, dumb shows aren't cancelled because dumb executives don't care that they're popular, right? What really seems to be happening is that smart shows are cancelled because reasonably intelligent network executives realize there aren't enough smart people out there watching them! They base these sad decisions on the Nielsen ratings. After all, they can easily see that the sale of their "products" aren't showing a profit, so they have to stop wasting money on shows that aren't watched by intelligent consumers. As Lilly Tomlin once said on The Johnny Carson Show, "It's called show BUSINESS, not show ART." Guys, I've been diligently maintaining All Sci-Fi for eleven years, and during all that time I've often wondered why we've never had several dozen creative and literate members who flood this board with fascinating, well-written posts! It took me a long time realize that the small-but-intelligent group of loyal and active members we DO have in any given year has always been the cream-of-the-crop, the Semper Fidelis of sci-fi fandom — the few and the proud who want to transmit their unique ideas from their brains to their fingers to their keyboards . . . and finally to All Sci-Fi so that like-minded people can enjoy them! In conclusion . . . keep up the good work, folks! Don't get discouraged. It's lonely at the top, right? And if making intelligent posts on All Sci-Fi was easy . . . EVERYBODY would do it!